What is a sprint in project management? The term sprint is used in agile project management, specifically in the scrum method. Generally, scrum is defined by regular and repeatable work cycles. Those cycles are known as sprints and are limited in time. The aim of a sprint is to develop a potentially deliverable product increment. Each sprint builds upon the previous and often previous developments are replaced or discarded again. Each sprint starts with the sprint planning meeting in which the next sprint is planned in detail. In the sprint planning meeting the Product Owner and the team discuss which requirements from the Product Backlog will be processed. The selected requirements are moved into the Sprint Backlog. In the end the Product Owner is responsible for choosing the requirements for each sprint, while the team decides themselves on how to meet those requirements. 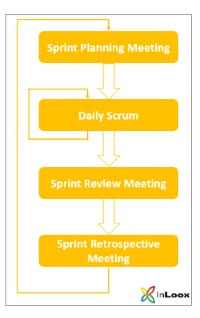 The most important activity during a sprint is the so-called daily scrum. The daily scrum meeting should not be longer than 15 minutes and always takes place in the same location and at the same time. The daily scrum is a team meeting that is guided by the Scrum Master. While the Product Owner plays an important role in all other meetings (activities), his attendance to the daily scrum is not necessarily needed. The purpose of the daily scrum is to determine the working progress of the scrum team. The so-called sprint review meeting takes place when the sprint is finished. In the sprint review meeting the product increment is presented to the product owner and other interested stakeholders. Afterwards the product owner examines if all requirement of the sprint backlog have been fulfilled. Requirements that are not fulfilled will move back into the product backlog. Additionally, a sprint retrospective meeting is conducted after each sprint. Therefore the scrum team gathers in private at the end of each sprint. The focus of this meeting is to reflect on how things went and what could be improved. The aim is to constantly improve the quality of collaboration. After the sprint review meeting and the sprint retrospective meeting, the next sprint starts and the whole process is repeated. What is a sprint in project management? • Copyright 1999-2019 © InLoox, Inc. All rights reserved.